Our farmers have worked hard this season to produce a bountiful cherry crop and Chelan Fresh cherries are readily available for at least one more month! The cherries this season are big and sweeter than ever! Now is the time to buy cherries and continue to enjoy them immediately or freeze some for later this fall. Contact your Chelan Fresh sales representative to ensure your cherry program lasts well into August. 509-682-4252. 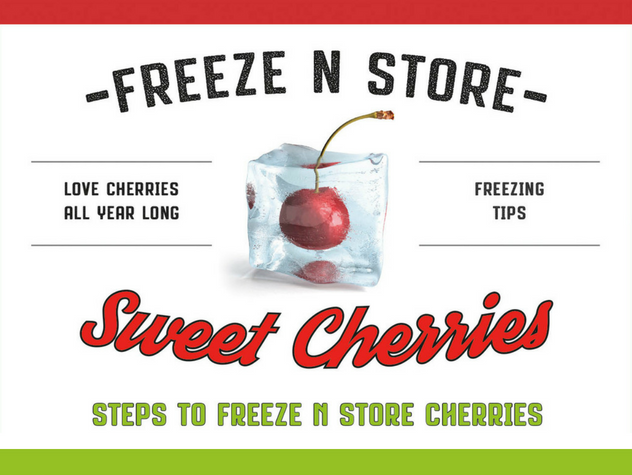 Click here for a few helpful tips on how to freeze and store cherries. Pear Season is Right Around the Corner! Summer is all about cherries, but we sometimes forget that by August, Chelan Fresh will begin to harvest pears and early season apples. Bartlett pears are the first to ripen and come off the trees in August and early September. Their sweet, juicy flavor is a sure sign that fall is on the way. With the addition of Borton Fruit and their Yakima Valley orchards, Chelan Fresh will have pears earlier than ever and continue to harvest through September in our Chelan Valley orchards. Our D’Anjou, Bosc and Red Anjou are harvested in late August and early September allowing our customers to have a complete pear program all the way through spring of 2019. Contact your Chelan Fresh sales representative to set up your pear program today. Many of the orchards in the Chelan Valley are a family affair, with women playing a critical role in running smooth operations and growing the business. In our blog series, “Women in Agriculture”, we sit down with them to discuss their roles and thoughts in the industry. This month we spoke with Gwynne Godwin of Box Canyon Fruit in the Okanogan Valley. Iris Santos started with Chelan Fresh in the fall of 2015 as part of the Chelan Fresh/Chelan High School mentorship program. She came every day as part of her high school curriculum and assisted with projects in our accounting department. After graduation she has continued to work every summer for Chelan Fresh and never hesitates to take on a new project. We applaud Iris’s continued hard work and determination both in the classroom and at Chelan Fresh. I was raised in Chelan and most of my family still lives here. I am attending Eastern Washington University. My major is Social Work with a minor in Children’s Studies and Spanish. What skills do you want to gain from this experience? Some skills I want to gain from this experience are self-reliance and tact. If all goes as planned, after graduation I hope to be able to travel before I prepare myself to return to EWU to obtain my master’s degree in Social Work. What extracurriculars are you involved in and why? I have not been involved in much my first 2 years at EWU, but as soon as I return I want to join MEChA to expand my knowledge on promoting Chicano unity and empowerment. I also want to do more volunteering at a high school in the Spokane area as a mentor for at-risk youth. What are you most passionate about learning — personally or professionally — and why? Ever since I had the opportunity to be a mentor in high school, I fell in love with the idea of learning more about mentoring and how having a mentor can make a huge impact in one’s life. This made me realize how much I love working with my community and helping others. I would like to live in this community because I think it’s a perfect place to settle and start a family. This community is great at coming together and being there for one another. Fresh Cherries… they are only here for a short couple of months, but they capture the full attention of retail Buyers, Marketers and Shoppers while they are available. There is always a fair amount of anticipation surrounding fresh cherries and this year was no exception. The California season came in later and with a much smaller crop than the prior year, resulting in significant Year-over-Year volume and dollar losses for our retail partners. Thankfully, the transition to Northwest cherries was much smoother this season and Washington fruit quality has been outstanding! Year-over-Year volumes have now been up for the last 3 reporting weeks (June 17 – July 7) and we are looking forward to continued strong movement through the month of August. If you have any questions about fresh cherry performance overall or in the specific markets where you operate, please let us know. Our Category Management team enjoys digging deep into the data and customizing market reports to support your business analysis and planning.